Happy Austraya Day! Depending on where you live in this continent, you are either basking in the sun or hiding indoor enjoying the cool sojourn from the relentless heat this week. Today also marks the end of the annual Sydney Festival. Sadly I didn’t venture to eat Gelato Messina’s mind bending creations, but I did manage to see Zhang Huan’s Sydney Buddha during a quiet rainy Sunday. 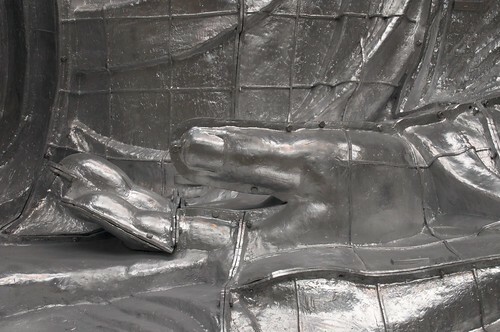 For a peek into how the Sydney Budha was created, watch this video here. This recipe originated from The Sustainable Table cookbook. Sadly, this book is out of stock and no longer available. 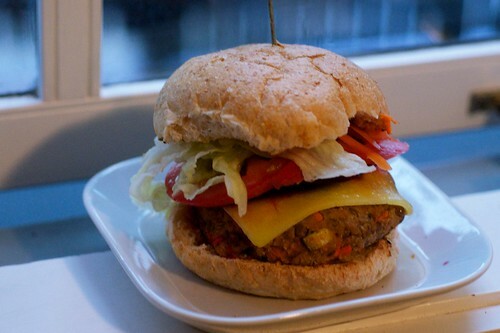 I adjusted the recipe a bit as I am not the biggest fan of a lentil only patty. Once you have all the ingredient this is a very quick recipe to make. If you want to store it for later, wrap the patties in cling wrap and place it in the fridge before you take it out for your Australia Day BBQ. Seasonal salad such as beetrot, grated carrot and lettuce. Drain and rise the lentils. Peel the potato and slice in to 2 pieces. Boil the potato until it’s soft. Combine all ingredients except the oil in a large bowl and mix well. Add salt and pepper as required. Using your hands, shape the mixture into 4 – 6 patties. Heat the BBQ or frying pan with some oil and cook the burgers on both sides until golden and warmed through. If using cheese, place it on the burger for a few minutes before taking it off the heat.